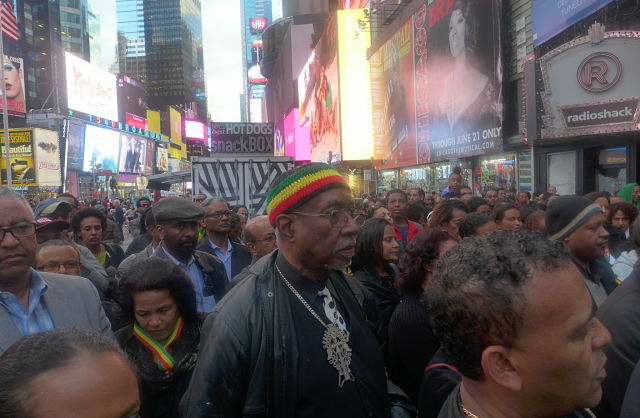 New York (TADIAS) — Hundreds from the Ethiopian community in the New York City area gathered at Times Square on Tuesday evening for a candlelight vigil to honor the victims of the recent ISIL violence in Libya. The NYC event included both Christian and Muslim religious leaders who condemned the murders and called for Ethiopians to stand united. Speakers included Abune Basilios, Kes Mezgebu Menkir of the Beata le Mariam Church, Imam Yisaq Ibrahim of the Ethiopian Muslim Community of New York and Abreham Desta of the Evangelical Church of NY. Additional speakers were Professor Getachew Haile, community activist Makda Amare, and Tsegereda Mulugeta. In her speech Makda, Chairperson of Humanitarian Organization for Ethiopians in Need of NY & NJ, shared with the crowd current statistics highlighting the continuing plight of female migrant workers in the Middle East as well as the victims of xenophobic attacks in South Africa, and countless Ethiopian citizens who are currently stranded in Yemen in the midst of civil war. Makda said her organization is working with International Organization for Migration (IOM) to help those in Yemen, but urged others to participate and also called on the Ethiopian government to do more. The evening also featured songs and the lighting of candles.